San Bernardino, Calif., January 18, 2011 –Volunteers are needed to assist in the annual bighorn sheep survey in the San Gabriel Mountains on the San Bernardino National Forest the weekend of February 26-27. If you are interested, you will attend an orientation class Saturday night, and rise early on Sunday to hike into the local mountains, spending the day counting and recording bighorn sheep. No previous experience is required; however, you must be at least 16 years old and be prepared to hike at least one mile in steep rocky terrain. “It is a great way to get out, enjoy your national forest, and have the chance to view wildlife that most in southern California have not seen before,” District Biologist Kathie Meyer said. In general, hikes will not be along trails and accessing survey points will involve scrambling over boulders, climbing up steep slopes, and/or bush-whacking through chaparral. Mountain weather can be unpredictable and participants need to be prepared for an early start on Sunday and spending several hours hiking and additional time making observations in often cold and windy weather. Where to meet: Volunteers must attend a mandatory orientation on Saturday, February 26, at 6:00 PM at Day Creek Intermediate School in Rancho Cucamonga. What to wear: Sturdy hiking footwear is necessary, since the terrain is often steep, rocky and un-even. Dress in layers, since weather conditions may change with little warning. What to Bring: Observers should bring binoculars or spotting scopes (if they have them) in addition to hiking gear. Bring water and lunch for the all day count on Sunday. Overnight Camping: Complimentary campsites will be available to volunteers on a first-come-first served basis. 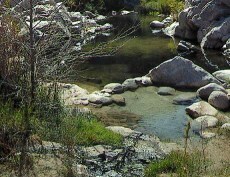 Camping will be at the Applewhite Campground in Lytle Creek on the night of February 26, 2011. Volunteer Groups: We will provide a representative from one of the participating partners to lead your group during the count. Please give us a call at (909) 382-2870 by February 17, to sign up and receive a volunteer packet. The US Forest Service, California Department of Fish and Game, and the Society for Conservation of Bighorn Sheep have conducted surveys for bighorn sheep in the San Gabriel range annually since 1979. The mountain range once held an estimated 740 bighorn sheep, which made the San Gabriel population the largest population of desert bighorn sheep in California. The bighorn population declined over 80% through the 1980 has but appears to be on the increase with recent estimates yielding approximately 350 animals.